It is deemed vital for Ukraine to restore cooperation with the IMF to unlock further international aid. 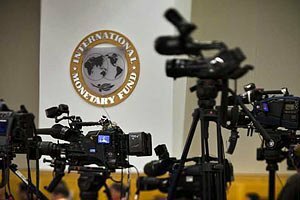 An International Monetary Fund (IMF) mission led by Ron Van Rooden has arrived in Kyiv and will be working there until 18 May, the Ukrainian Finance Ministry's press service has reported. "The mission has arrived and started working," the press service said. The IMF experts will continue policy discussions with the Ukrainian authorities in the context of the 2nd review of the Extended Fund Facility programme for Ukraine approved in March 2015. Since September 2015, Ukraine has been unable to receive the third tranche of the IMF loan. The fund has been waiting for clarity in the situation with the Ukrainian government and parliamentary coalition. The four-year EFF worth about 17.5bn dollars originally foresaw quarterly reviews of the programme, the disbursement of four tranches to Kyiv in 2015, and another four in 2016. However, by now, the country has received only the first tranche worth 5bn dollars on 13 March 2015 and the second one worth 1.7bn dollars arrived on 4 August 2015. The second review is under way, as Ukraine and the IMF are in talks on a wide range of issues, which includes various aspects of monetary, banking and anti-corruption policies, pension reform and privatization. On 10 February, IMF head Christine Lagarde said the funding programme for Ukraine's may be suspended due to slow progress demonstrated by Ukraine in improving governance, fighting corruption and reducing the influence of vested interests in politics. Finance Minister Oleksandr Danylyuk said it was vital for Ukraine to restore cooperation with the fund as it would help it to unlock further international financial assistance.